Experience some of the most unique, entertaining and educational presentations on ghosts, legends and folklore of New England and its regions. Full of historical and scary facts for schools, libraries, colleges, societies, retirement and assisted living facilities, special occasions and more. Presentations easily accommodate small conference rooms to large auditoriums and theaters. The Graves Of The Famous Smuttynose Island Murder Victims In Portsmouth, NH. You will not believe your eyes and ears as you take this journey to some of the most haunted places in New England. Bara-Hack, The Victorian, John York House, Belcourt Castle, an 1801 farm in Thompson, The Tavern on Main. These and many more complete with videos, pictures, EVPs and some amusing events await, as this presentation becomes your personal tour guide to the other side WITHOUT EVER HAVING TO LEAVE YOUR SEAT! Mercy Brown was New England's Last Known Vampire Case. This Gruesome Exorcism Took Place In 1892. At one time New Englanders actually believed that the undead walked among them in the dark bowers of the night. Feeding upon their kin, these “ghouls” petrified families for more than 100 years. Scores of families exhumed their loved ones looking for the "spectral ghoul" that plagued them. Accounts and actual newspaper articles help tell the story of how people once took desperate measures to rid themselves of what we now know as the New England Vampire. The Famous And Tragic Willey House In Crawford Notch, NH. Eerie, Scary and Astonishing! Incredible characters, mysterious places, and unexplainable occurences lead you on a strange and educational trip across New England you will want to take again and again. The truth, indeed, is stranger than fiction. Excellent for school programs. Boulder Marks Dogtown Square Where The Roads Of The Abandoned Town Converge. New England is full of lost towns and villages. Many are haunted. Why did they fall by the wayside? Very historical and educational. An amazing presentation that will enlighten you on the demise of many New Engand's villages, maybe even scare you a bit. The Tavern On Main In Chepachet Is RI's Most Haunted Public Landmark. The smallest state in the Union is home to the most haunts per capita. Take a paranormal trip through the Ocean State and witness some of the strangest haunts and legends in the region. Educational and spooky. The Ghost Of Pelg Walker Turns The Ramtail Factory Wheel. Rhode Island's officially haunted site as per the 1885 State Census. Learn the secrets as to why it is haunted and who actually still roams the ruins centuries after their demise. A very educational and mysterious account that has captivated many who have visited the site. So much so, they want to return again and again in hopes of seeing the ghost of the night watchman. New England's history is full of strange and mysterious figures. Meet some of these incredible people whose lives ranged from outlandish to out of this world. Meet the Eddy family, Vermont's seers. Travel to woonsocket, RI to see New England's only stigmata victim. 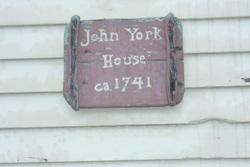 Head to York maine where the reverned wore a veil over his face. These and many more will make you beleive that truth indeed is stranger than fiction. Take a paranormal excursion through the Constitution State and experience some of the state's most interesting haunts. Ghost towns, odd figures, scary sites and haunted cemeteries are among the many places awaiting your arrival. New England is rich with stories and legends of ghost ships and pirates long dead. Blackbeard, Sandy Gordon, Captain Kidd and many more once called the region home; and still do. Phantom ships continue to roam the waters of the New England coast. Some mysteriously abandoned while other vanished never to be seen again , in the physical form anyway. Learn why Marblehead dreads the screeching Lady or who haunts the Isles of Shoals. Why does a phantom dory stalk the water off of New Hampshire and what happened to the Sea Bird's crew? Visit a real life haunted ship and more. ​Birthdays? Why hire a D.J. or a clown? They may be cool but ghostly presentations give you somewhere to explore after the show. Complimentary book for the birthday person. I CAN CUSTOM TAILOR PRESENTATIONS UPON REQUEST TO SUIT YOUR NEEDS. NOTE: All presentations come with a generous portion of ghosts, legends, educational and historical facts, pictures and other evidence we have collected during our travels along with a healthy side of humor that will make a believer out of anyone.